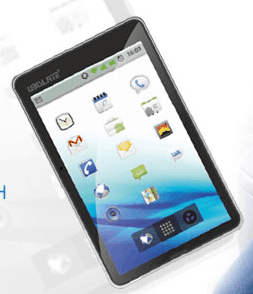 It's been just over 2 months since the India govt launched the Aakash tablet, and sales have been good. In fact, sales have been so good that it looks like the entire 1ook order has been shipped. Earlier this week the Aakash website was updated with a sold out tag; there's no mention of when more Aakash tablets will arrive so I would bet that they're not going to. But on the upside Datawind, the gadget company that built the Aakash tablet for the Indian govt, is now promoting a replacement for the Aakash. The Ubislate is due out in January, and it's a slightly more expensive and more capable close cousin of the Aakash. It's still using the same 7" resistive screen, but it's also running newer version of Android (v2.3 Gingerbread) on a significantly faster CPU, and it will have a Wifi and a GPRS data connection. The Ubislate7+ ships with 2GB Flash storage, and it offers an SD card slot for expansion. The retail price is 3,000 rupees (~$60 USD), so it's only slightly more expensive than the Aakash. This tablet is going to be made in India by a subcontractor, and production is going to be around 1 thousand tablets a day. What I find most interesting about the Ubislate7+ is that it was mentioned when the Aakash was launched as a related model, not a replacement. One was going to be for students and the other was intended for the retail market. In fact, the Indian government had ordered 100k Aakash and had planned to expand that order to a million tablets. But now the Aakash is dead. I wonder if the quality and performance was so low that no one wanted to use it? I cannot recall seeing any reviews, but that doesn't mean that there wasn't a word of mouth campaign against this tablet. Did You Remember the Memory Card for that Tablet/E-reader?